Even as a clueless junior at Castleton State College, in Vermont, I knew the idea was really something when I heard about this new “All Star League”. I wasn’t far from some of the tracks whose teams played an important role in the league, and I was actually right in Milton, Vermont when its hometown track, Catamount Stadium, had teams in the league; but, I never got too close to it. The reasons included getting through college, getting married, and trying to survive as a new teacher – but I only made it to three races in the entire seven year history of the League. These four men were always the backbone of the League. I do know one of the main reasons for this lack of connection. 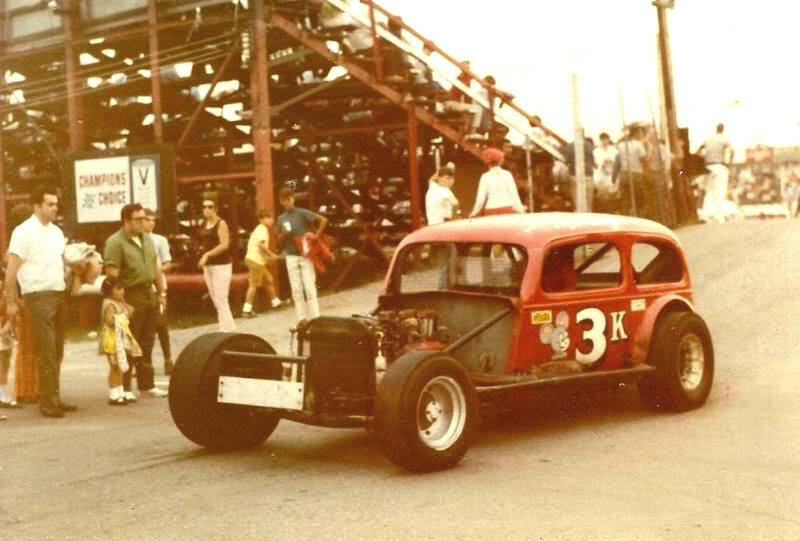 In 1967, with Devil’s Bowl Speedway not included in the League, Joe Lesik’s Albany – Saratoga Speedway was the nearest League track, and we did make it to one of the 1968 shows. By the time I got my teaching gig in Milton, the modifieds no longer ran at Catamount [although, inexplicably, the track kept League membership]. This limited my League viewings to perhaps one Malta, one Fonda, and probably one Catamount show. Very limited experience on which to base a column, but, oh well – that hasn’t stopped me before. From what I can learn, the idea was a brainchild from Long Island, in the persons of Larry Mendelsohn, the Islip Speedway promoter, and big Lou Figari, often described simply as “a sports promoter”. The inaugural League had eight teams, each with three drivers. The idea was to test top notch drivers’ abilities to not only excel on their familiar track surface [dirt or pavement] but to manage to do well on the other, as well. The first eight teams included Mendelsohn’s Islip Speedway; Wall Stadium, in N.J.; Riverside Park in Massachusetts; Fonda Speedway; Albany – Saratoga Speedway [a track that Larry and Lou would end up running at one point]; Flemington [NJ] Speedway; Orange County Speedway, in Middletown, NY;, and Nazareth Speedway in Pennsylvania. The first winning All Star League team, that of Fonda Speedway, was re-created in this 2004 photo by some lucky vintage race fan or writer. Wimble, Narducci, and Gahan. Below – Ron Narducci, in his most familiar car, was another loyal and versatile driver. He managed to be on 4 of the 7 championship League teams. A factor that weighed heavily on the results and success of the All Star Stock Car Racing League was willingness or ability of the various team members to actually attend races. Fonda’s team of Bill Wimble, Ernie Gahan, and Ronnie Narducci won the first year of the League, running away. The trio did not win a single race in the series that year; but, the team averaged a race attendance of 2.75 out of a perfect 3.0. Contrast that with the apparently – uninvolved Flemington team, at an average of one driver per race [1.0], with that including a Riverside Park race with none of the team showing up. All three Flemington members did not appear in the actual feature at any of the eight races. I wanted to be fair and state that their sphere of familiarity required more travel than the rest – but it didn’t. Besides, three of the participating tracks were tracks a Flemington guy would be running anyway. Second place Nazareth had the longest hauls to races, and they still managed 482 points, 105 back from Fonda. Each race had 30 drivers in the feature, and it was theoretically possible for 24 of these to be League team members. Albany – Saratoga opened with the first –ever series race and saw 57% of the field League members. Of course, “Missing” league members may have simply failed to qualify. Sometimes visiting an unfamiliar track whose surface was different than yours presented so many problems you didn’t even make the main event. I recall Mousey Kempster, who was used to short asphalt ovals, laboring around Fonda with clearly the wrong gear. 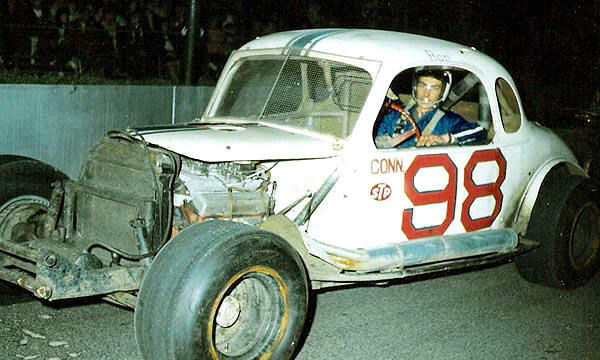 Below – Lou Lazzaro was the consummate All Star Leaguer, along with Frankie Schneider and Buzzie Reutimann. They could drive on anything. Lou and Buzzie won features on both surfaces. 57% was about typical of League member attendance in 1967, with the final race at Riverside getting only 47%. That may be accounted for by the grind of the season by then. Things like ruined cars and injuries must be factored in. It is not clear why a team like Flemington had such a poor showing. Mike Grbac only showed up at one track – his own. He was probably threatened with certain death if he didn’t. 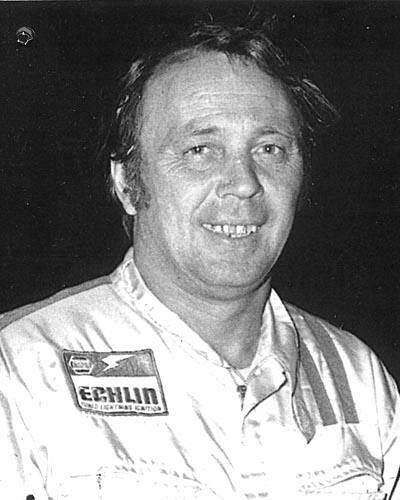 Gene Bergin was the first of many open drivers to win an All Star League main event. He did this at Wall Stadium. Below – Eddie Flemke, 9th overall in all – time League standings, chased Bergin across the line ahead of Wall team member Tommie Elliott. Gil Hearne, a Wall regular, was on the Islip team; Charland, on the A-S team, was at home at Riverside, Malta, or Fonda. The Flemington and Nazareth teams could be interchangeable; Eddie Flemke could run on asphalt anywhere; some of the open drivers such as Don MacTavish, Leo Cleary, Jerry Cook, Budd Olsen, and Pete Hamilton were just as good, if not better, than some of the League members. The League would go, changing teams and members. Fonda won again in 1968 – perhaps for the same reason. Nazareth, largely on the strength of having Schneider, would again finish in the top three, switching places with Albany – Saratoga for third. Norwood Arena came in; Riverside Park dropped out. Virtually a non participant in 1967, the extremely versatile Lou Lazzaro would succeed Schneider as the overall champ in 1968. One of the most powerful displays of driving skill took place at Nazareth in 1969 at what was termed a “championship” race. In that affair, on that most vexing and intimidating of tracks, the Orange County team of Reutimann, Olsen, and Leon Manchester [in that order] finished one – two – three, besting a field of 50 cars that consisted of only 30% League team members. The rest were open drivers most of whom were very experienced at Nazareth. Two Nazareth team members finished 6th and 7th; no other Nazareth or Flemington cars were even near. This was the last Fonda team, the 1968 champions. Fonda regular Lou Lazzaro, the 1968 individual champion, was on that team. 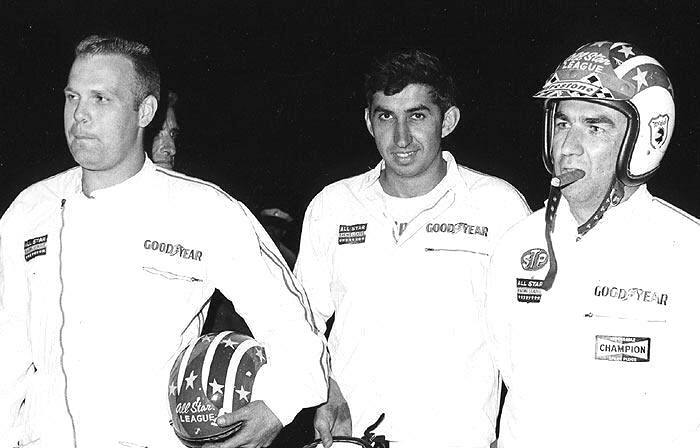 Jerry Cook [left] joined Andy Romano and Rene Charland on the Albany – Saratoga team, which came in second. In 1969, the dominant Fonda dropped out entirely, and the League consisted of the winning Nazareth team, Orange County, and the still - powerful Albany – Saratoga bunch. Islip remained, and Flemington still held up last place. Catamount Stadium succeeded Fonda, took its members, and finished fourth. Stafford Springs and Norwood rounded out the eight teams. After 1970, I have little data to follow the League through 1973. Its demise, according to Ken Parrotte, a League historian, came about due to the 1973 energy crisis; but, it may have passed anyway with the deaths of Mendelsohn and Figaro in 1974. 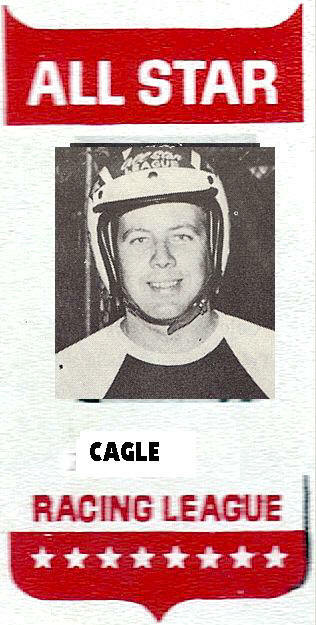 Will Cagle, who stuck with the League from its inception, ended up as the overall best performer, with Buzzie Reutimann and Richie Evans close behind. Schneider , who was so dominating in the first two seasons, probably had begun to wind down his racing by the earlier 1970’s. Frankie finished 7th overall, and had five wins. Evans had the most wins with 8; Cagle had the most top three finishes with 19. 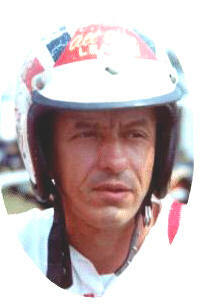 Schneider was the 1967 champ; Lazzaro won it in 1968 and 1971; Cagle won in 1969; Maynard Troyer won the title in 1970; Jerry Cook was the 1972 champ; and Reutimann was the final titlist in 1973. Evans was the highest – finishing non – Champion, ending up third overall. The six series champions, with Lazzaro winning in 1968 and 1971. Below – Richie Evans won the most, although he raced little in the first few years of the League. From some results sheets, it appears that other tracks to join the League, at one point or another included: Lancaster Speedway; Lebanon Valley Speedway, Autodrome de Quebec;Rolling Wheel Speedway; Oswego; and Shangri – La.Two races, both won by Ray Hendrick, were held at Dover Downs in Delaware; doubtless, it was a neutral site as may have been true with some of the tracks listed above. There was a race at Bridgeport Speedway, too, although I doubt it was part of the League. East Haddam, Connecticut’s Ron Narducci may well have been on the most championship teams in League history. Of the seven years the organization ran, he was on four winning teams: two with Fonda, one with Albany – Saratoga, and one with Catamount. In the seven years and seventy – nine races of the All – Star Stock Car Racing League, Narducci never did win a race; but, he had one of the all – time best race attendance records [and that meant a great qualifying effort]. According to Ken Parotte’s excellent research, the League had 37 different winners on 18 paved tracks and 17 dirt tracks. 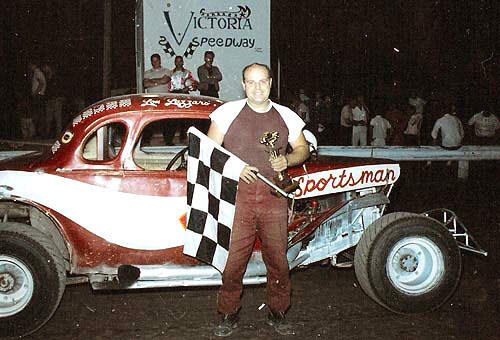 Only Lou Lazzaro and Buzzie Reutimann managed wins on both surfaces. It is appropo that they both got to be champions. This 1969 issue was typical of the frequently – changing All Star League program. One of the laments at the Saratoga Auto Museum’s Lost Race Tracks Conference in 2013 was the lack of materials people have left over from the All Star League. It would be great for people to send copies of items to Ken Parrotte, who I think is a banker in Fulton, NY. I would not publish an email address because I am not sure if Ken, the historian, is indeed the same as Kenneth Parrotte, the banker. I am sure that Ron Hedger, at the museum, would know how to get a hold of Ken. Most of us who are old enough to have seen the All – Star Stock Car Racing League remember the helmets that team members wore,. While my friend and racing legend, Beaver Dragon, reveres his NASCAR Winston Series Champion helmet as one of his most cherished mementos, a lot of guys in the modified world feel the same about their All Star League helmets. 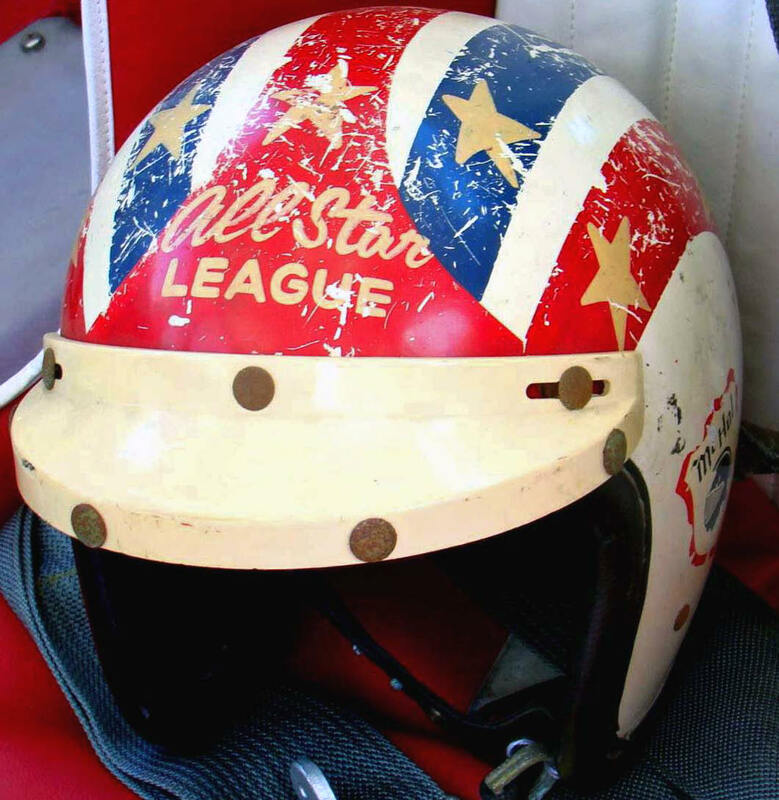 Charlie Jarzombeck's much – loved All Star League helmet sits on display somewhere. The seat looks too modern for the All Star League years. Mendelsohn, the huge Figari, his equally – huge Race Director Bob O’Rourke, and publicity man Tim Sullivan saw their pet project through seven good years. Today, something of this nature would be very much harder to pull off. Even tours like ACT are finding it harder and harder to find people willing to travel. Wouldn’t someone like Narducci, Schneider, or Stevens have loved travelling around to those races in one of today’s half – million dollar tractor trailer haulers ? 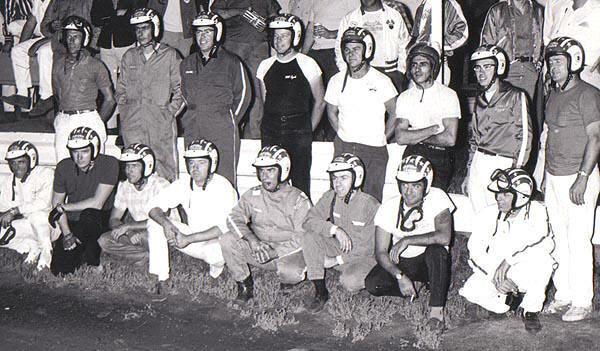 This shot of the All Star League drivers at one of Fonda shows is one of the best photos there are. So many drivers are recognizable. Apparently, the dominating Lazzaro was not a member yet – so it must be 1967.